Getting kids involved with STEM is all the rage right now. But how do you introduce young kids to Science, Technology, Engineering and Math while keeping it super fun? Squishy Circuits (AKA Electric Play Dough) is how! This blog post contains affiliate and referral links which may reward me in the event of a subscription or sale. I use these funds to feed my dog. Thanks for the dog food. What are Squishy Circuits? Are they really Squishy?? 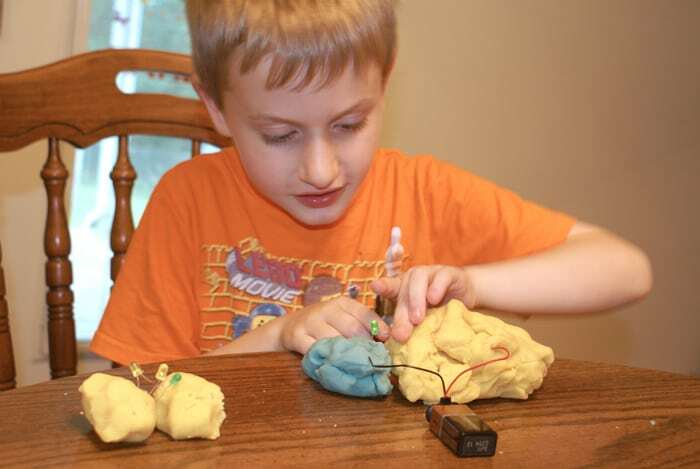 Squishy Circuits mixes homemade play dough with battery power to learn about circuitry in a totally fun and artsy way. You make a basic salt dough (it’s pretty much the same recipe as homemade play dough) and hook it up to a 9 volt battery or pack of AA batteries. Hand the kid a bunch of LED lights and see what they learn! Add “insulator” dough–made without salt–and you can make sculptures with light up eyes or spots! Playing with exposed batteries might sound a little dangerous if you’re from the helicopter school of parenting, but there’s really nothing serious to it. There’s only one rule…don’t touch the battery wires together. Got it? Then we’re good. 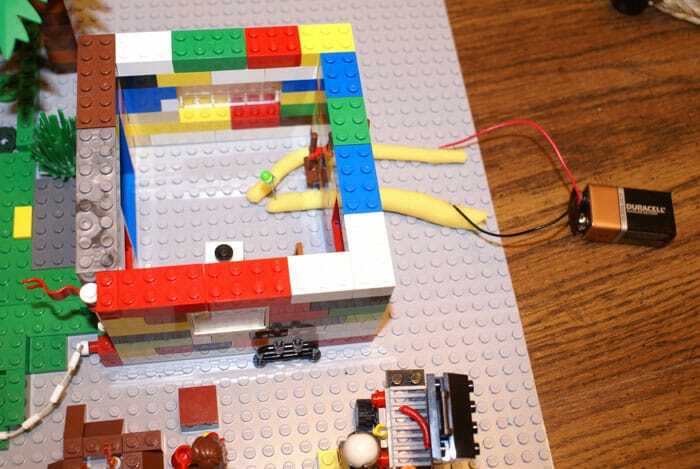 There’s two ways to go about Squishy Circuits, DIY or with a kit. If you want to do it NOW, then DIY is the way. You probably have everything to make the conductive and insulator dough. Cream of tartar is the only odd ingredient on the list–I don’t know what uses cream of tartar besides Snickerdoodles. And insulator dough is going to work better with distilled water. If you don’t want to chase down all the wiring and gizmos–and want a package you can wrap up as a gift–then you can buy a kit like this one. The electronic bits, like LED lights and battery holders can be picked up locally at MicroCenter in Brentwood. They also carry terminals which you can crimp to the ends of the battery wire to get more juice into your Squishy Circuits. Squishy Circuits was developed by AnnMarie Thomas from St. Thomas University. This is her recipe. Her website is a great resource for anyone who wants to make Squishy Circuits for the classroom or youth groups. Squishy Circuits dough is made on a stove. You’ll need a medium sized pot and large spoon to make the dough. Mix all the ingredients in a saucepan and cook over medium heat. Stir! Keep stirring until the dough gets chunky and forms a ball. Now place the dough on a lightly floured surface. The dough is hot at this point, so let it cool if you’re going to let your kids help knead the dough. Knead the dough until you have a good consistency. The dough can be stored in a plastic bag and will keep several weeks. The insulator dough is mixed cold. You’ll just need a mixing bowl and your hands for this one! Distilled water is VERY important–tap water or other bottled water has minerals in it that will mess up the insulating properties of the dough. I’m on St. Louis County water, unfiltered, and I can’t get the insulator dough to work without distilled water. Mix flour, sugar and oil in the bowl. Add the distilled water one spoonful at time to the dough. You may not need all the water. (Ever make pie crust? It’s a lot like that.) Once the dough has formed into a ball, move it to a floured surface and knead until you get a good consistency. It will be sticky, just keep adding flour until you can stand working with it. Note: you can add food coloring to this dough if you want. The idea is to make the conductive and insulator dough TWO DIFFERENT COLORS so you can remember which is which. Also, Squishy Circuit dough is obviously non-toxic and quite edible…at least when it’s fresh. The insulator dough is very sweet, so if you’re working with little ones, don’t tell them they can eat it. Because they will. Take two small balls of conductive dough. Stick a wire from your battery pack into each ball. Place a LED into both balls of dough–the lights have a positive and negative wire, so if it doesn’t work the first time, flip it around. It should light up. Touch the dough together and the light turns off! Don’t worry about the dough shocking your kid, there’s not enough current running through it. As long as you don’t touch the two wires directly together, you’ll be fine. We did this without any trouble, and Squishy Circuits have been used in kindergarten classrooms. It’s perfectly safe. Sylvia of Sylvia’s Super-Awesome Maker Show made this super awesome video about Squishy Circuits. She also explains some basics about circuits and electricity, so sit the kids down and watch this before playing with the dough. It’s hilarious. If you like Squishy Circuits…. There’s a lot of STEM toys out there that help kids dabble in the sciences. I like Snap Circuits–we discovered them after playing with a few at the Magic House.